Lovely sunshiney morning here in the Cotswolds. A post-breakfast survey of the estate (!) revealed much to be excited about. A promising abundance of spurs on our espaliered Braeburn apple – last year we only got one apple! My apple- crate seedbed hiding its first entry of the year. Hispi cabbage, to be transplanted to the allotment when big enough. 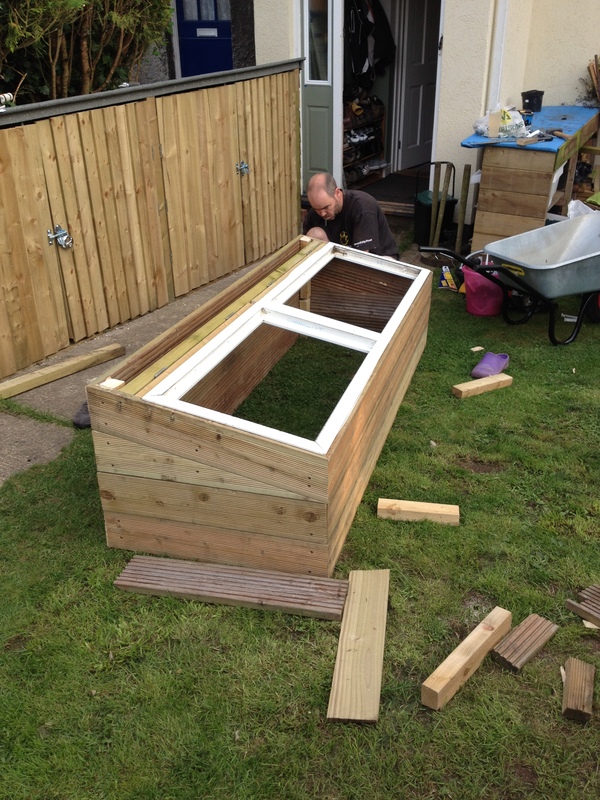 Last but not least Mr MBaF’s fab new little greenhouse on our decked suntrap – hopefully the ideal conditions for bumper chilli crops. 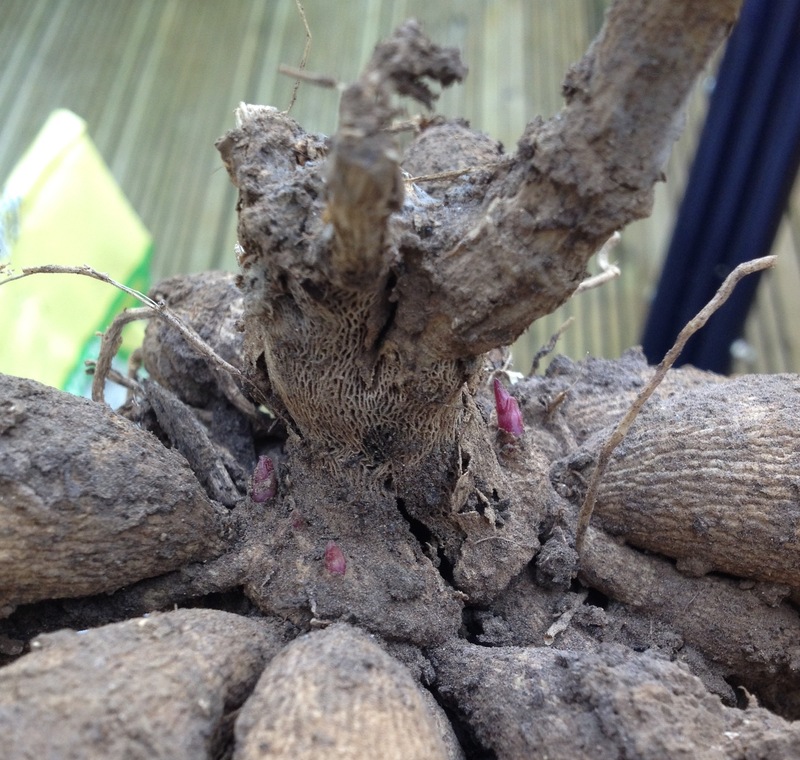 Back in autumn I mentioned that was going to try and nurture the tubers of my Bishop’s Children dahlias – grown from seed last year – so they get through the winter. 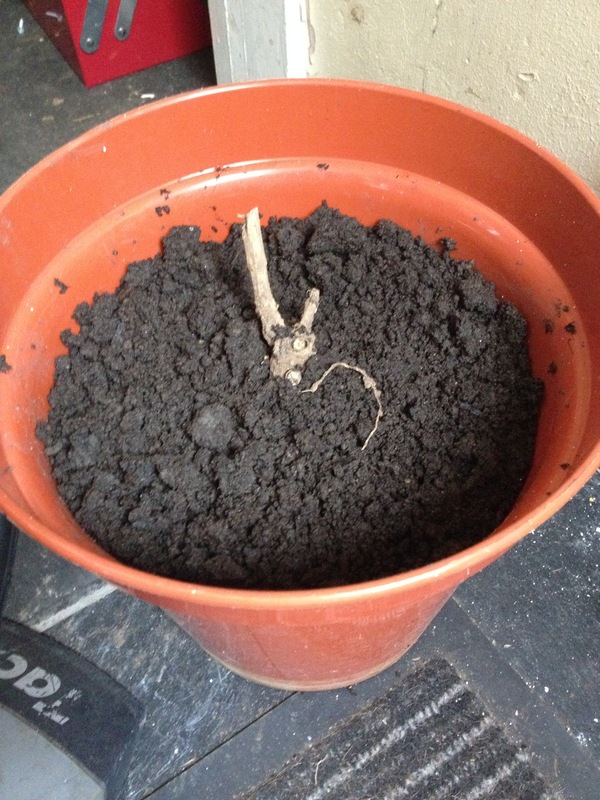 ‘Nurture’ is used in the loosest sense, meaning essentially that I didn’t dig them up and throw them away. My toddler gave some a scattering of mulch (wood chippings) to protect them from frost, and I dug one up and stored it in a box. Better gardeners take a great deal of care with their dahlias, but I originally grew mine as annuals so any surviving tubers are a bonus. I’m yet to discover if the tubers in the ground are OK, but it hasn’t been a very harsh winter (yet) so they’ve got a chance. But today I had a close look at the boxed one, and was very happy to see three healthy little shoots emerging from the centre of the clump. This is pretty impressive given the treatment it’s endured. 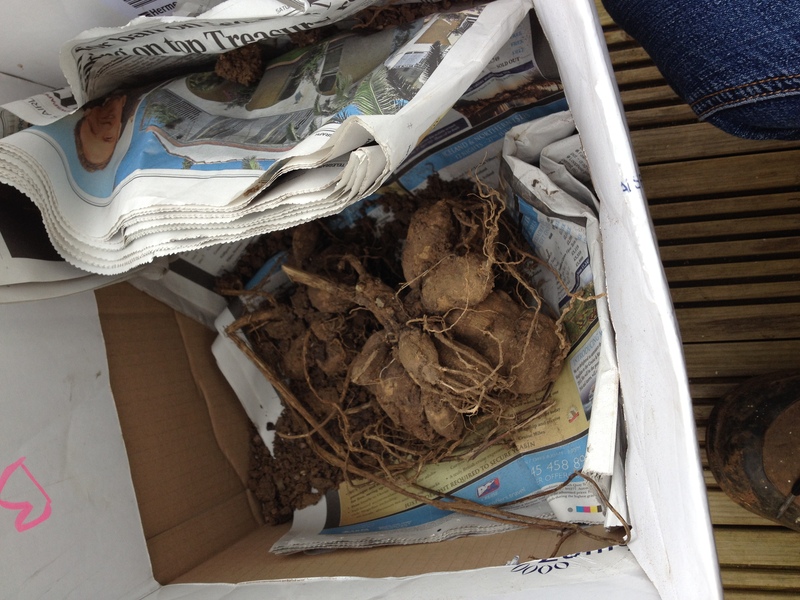 My intention was to carefully remove the soil from around the tubers, and gently pack them in dry compost. The reality is that I shoved it in a cardboard box on top of some newspaper and left it in the utility room. Having read something in my new magazine about it being time to pot up healthy tubers, I got on with this job for my single specimen (into top soil, because that’s all I had). I then realised my magazine was the March issue and Monty Don suggested they should go into a cold frame in the middle of the month. Hey, so I’m a bit premature, I’ll keep my potted dahlia in the utility room for a few weeks before sending it up to to the cold frame – which has been newly positioned on the sunny bank up at the allotment. My gardening notes, plans, plant lists and to-do lists have traditionally lived on various scraps of paper and writing pads. Which is fine…until Mr MBaF uses the other end of the same pad to design a shed. Then I lose track of all the scraps and pages. But then Father Christmas brought me the RHS record book I’d requested, and shortly afterwards I doubled my library of gardening diaries with the Three-Year Allotment Notebook. I’ve written a few lines in the latter, and not a jot so far in the former, so consider this more of a preview than review. 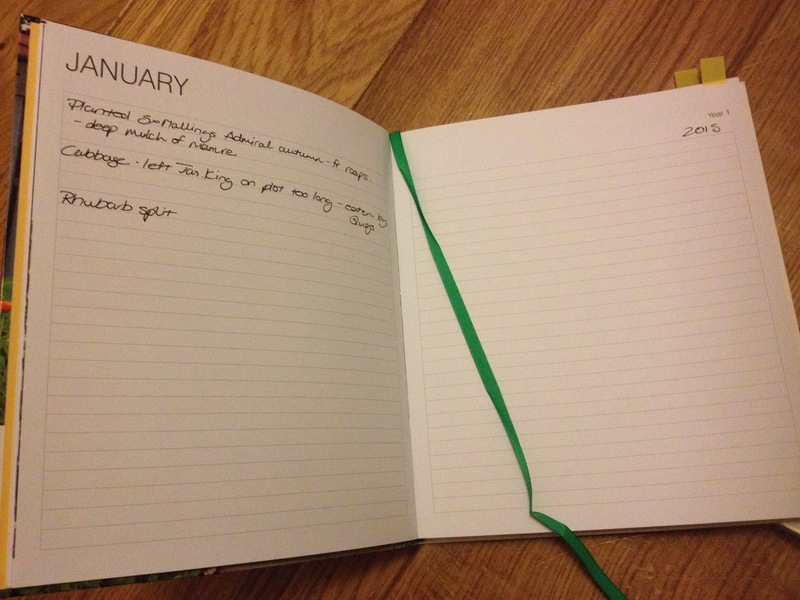 The first word I’d use to describe Joanna Cruddas’ allotment notebook is delightful. It’s full of gorgeous photos (by Edwina Sassoon) of some lovely plots, and the layout feels relaxed and helpful. Each month is bookended by three richly colourful photo-led spreads with hints and ideas (planning, watering, tools etc) and lists of seasonal jobs. 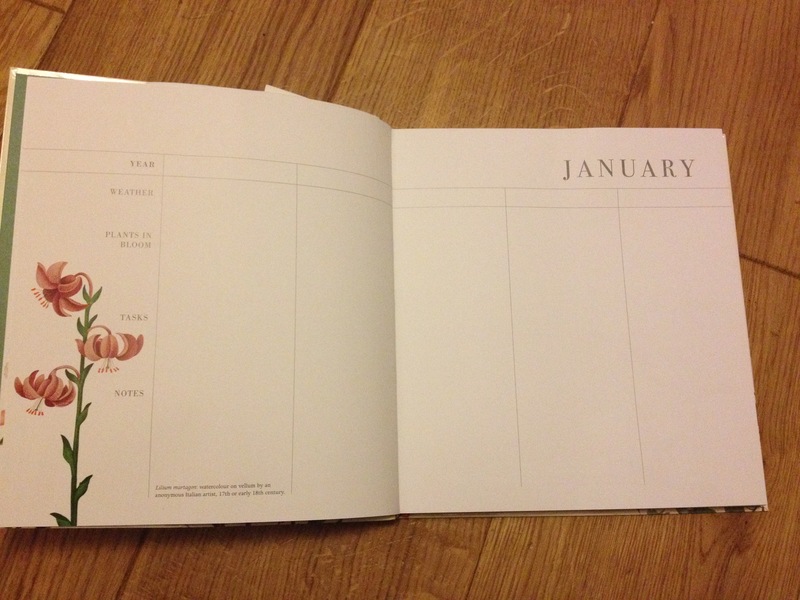 Then there are three blank spreads of lined pages for notes Year 1, 2 and 3. There is graph paper at the back for plot planning, and the inside of the back cover has a useful pocket for plant labels or other ‘stuff’. You could argue that for near-enough £15 I don’t have that much more than the A4 lined pad I used to use, plus a few pictures. But I disagree because this book is gorgeous and lovely. I’ve tried really hard to write neatly in it so far, but actually I’m looking forward to taking this companion with me to the lotty and getting it a bit grubby! The photos have also inspired me to make the plot a bit more characterful this year. I’m trying to think of how to involve Miss MBaF in making some flags or other spangles. Now onto the serious business of the RHS gardener’s record book. 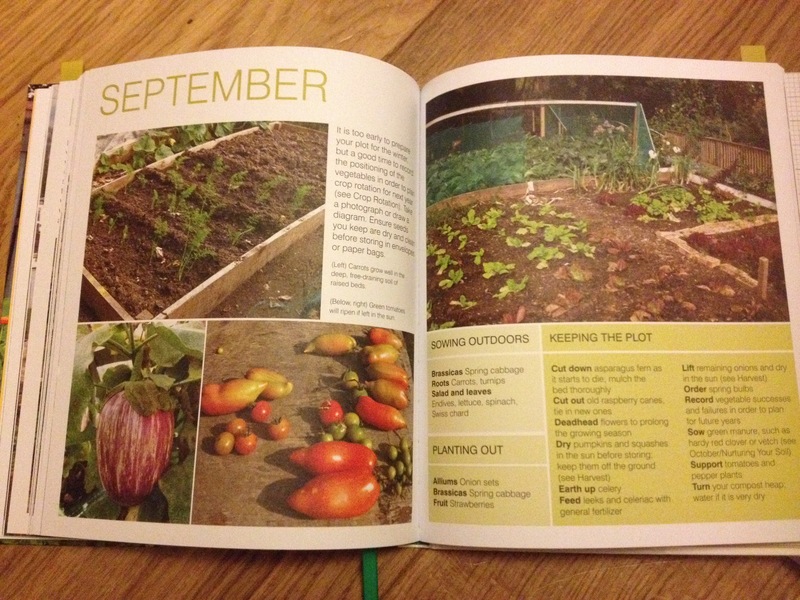 And in contrast to the ‘delightful’ allotment book, this one is definitely more businesslike. It has antique fine art illustrations of plant specimens throughout, and the notes pages are divided into five columns for each year with space for notes on the weather, plants in bloom, tasks and notes. Towards the back there’s space for listing plants to buy, plant suppliers and gardens to visit. The paper stock is thick and shiny, and I don’t really want to get this one muddy. More formal notes pages in the RHS Gardener’s Five Year Record Book. Although I originally envisaged I’d use it for both allotmentry and gardening, the RHS book is clearly and obviously designed for logging observations about ornamental planting. It’s probably more suited to much more experienced/skilled flower-growers than me, but I’ll give it a shot anyway, and try to write neatly for five whole years! Miss MBaF announced this morning she wanted to go to the allotment. With the UK in the midst of storms bringing high winds and heavy rain, this isn’t the ideal day for messing about on the earth. But I’m keen to instil in her a love of gardening, not least so she’ll be willing to join me on the plot when there are lots of jobs to be done later in the year. So I thought of an easy job she could help me with: mulching the dahlias with bark chips. NB. I planned to do this weeks ago, hey ho, it’s not been very cold yet so hopefully they’ve survived up til now. We got suited and booted, filled a bucket with the mulch, she hopped on her trike and we set off merrily. She/we got the job done (see pic above) and I showed her the raspberries I planted yesterday, explaining that she could help me pick/eat them in the summer. As we toddled off the plot, she said “We’ve had great fun at the ‘llotment!”. Mission accomplished. – harvesting potatoes. Miss MBaF loved finding spuds in the earth as I lifted the plants. – picking strawberries. Who wouldn’t?! – filling pots with compost. She spent ages happily trowelling potting compost into plastic pots. I would keep her occupied with that in the back garden while I did my own jobs. – sowing seeds. Choose large ones that are easier for little fingers to handle, like sweet peas, beans, radishes, sweetcorn etc. – transplanting seedlings. Miss MBaF is a particularly careful child, so she did a surprisingly good job gently lowering seedlings into planting holes for me. Make sure you’ve got plenty of extras if your toddler is boisterous. – planting bulbs. I made the holes and she dropped them in, proudly instructing “pointy bit up, tickly bit down” as she worked. Now the daffs are poking through, it’s nice for her to start seeing the results of her work. – going to the garden centre. Not a ‘job’ as such, but larger/more commercial garden centres generally have animal-shaped garden ornaments – and a cafe – to keep little ones happy in between waiting for you to browse the seed packets. One near us even has a playground and small petting zoo! NB. there are some health risks to be aware of with handling compost, so make sure your toddler wears gloves, do it in the fresh air, and wash their hands afterwards. The RHS has all the info and great advice. 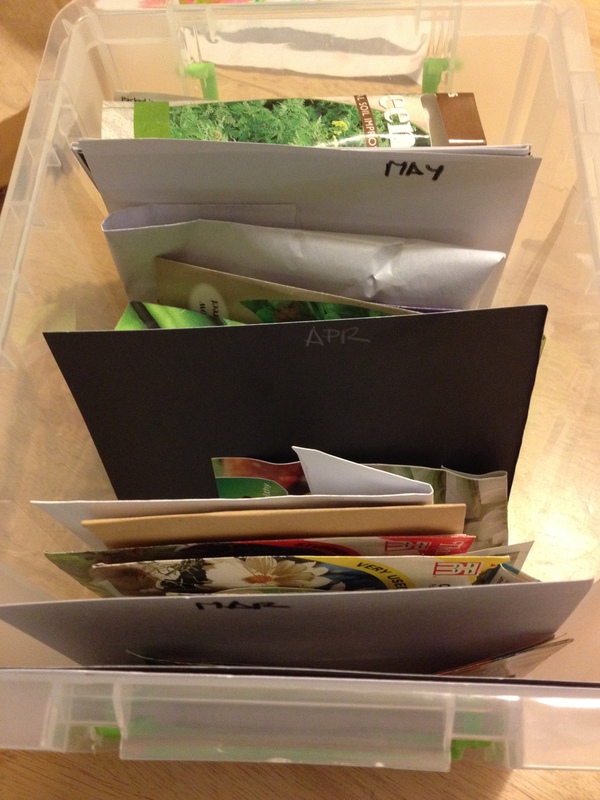 Just as a shiny new pencil case and stationery would give me a thrill before the forthcoming school year, tonight I’ve enjoyed sorting out my seed-storage before the next growing season. Nothing fancy, but a £3 transparent plastic box with 12 homemade month dividers (tip from Gardeners’ World Mag) have replaced the jumble of packets in an old Quality Street tin. Thing is, 90% of my packets have sowing times in March or April…I’m already having a mild panic about how I’m going to manage it. I’m thinking, no trips away, no work, and set up camp at the ‘lotty for 8 weeks! How does everyone organise their seeds ‘n’ stuff? Do other UK readers covet Monty Don’s gawjus seed cabinet as seen on BBC Gardener’s World….or is that just me?! 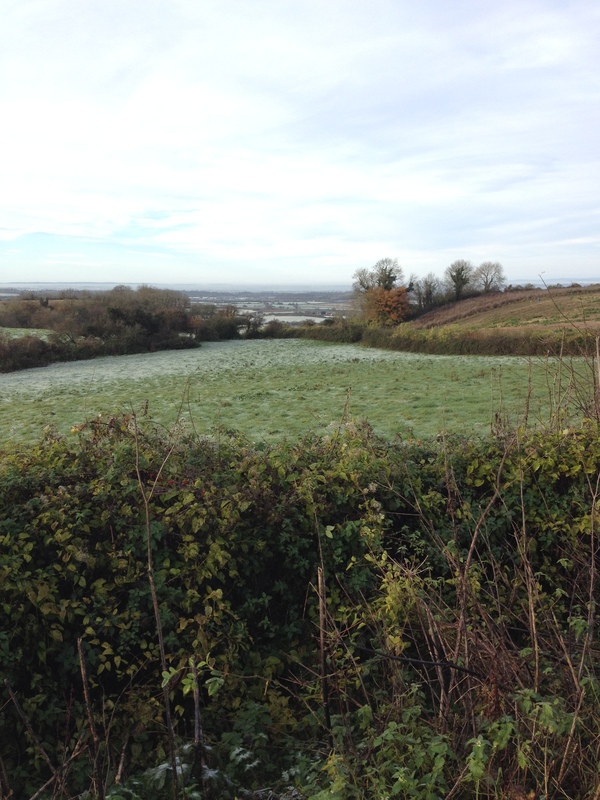 This morning’s dog-walk was glorious, with frosted grass making the fields twinkle in the sunlight. It’s not crispy yet; the ground is still squishy and slippery under the dusting of icing. But the wintry signs are appearing, and there are three jobs I need to get on with this week. This summer I decided penstemons would feature in my 2015 garden, so I bought a dozen seedlings from Hayloft and stuck them in the ground. I’ve read that they can be a bit tender, and our garden is quite exposed, so I need to take steps to protect them. Leaving this year’s foliage on until spring is supposed to help protect the important crowns. But my plants haven’t had time to bulk up yet, so I’m going to mulch them with a pile of bark chips too. I’ll do the same with some of my dahlias at the allotment – Bishop’s Children – which have unexpectedly developed great big tubers after growing them from seed this year. Our soil is very free-draining, so [I’ve read] they might be OK with a good layer of protection on top. However, I’m also going to try lifting and storing a few as recommended – in a shallow box in compost in a frost-free place. Both approaches are an experiment for me, I’ve never grown dahlias before and didn’t expect this variety to be perennial – but their colour is so intense, great for cutting, and the bees like their open blooms, so they’re worth the effort. 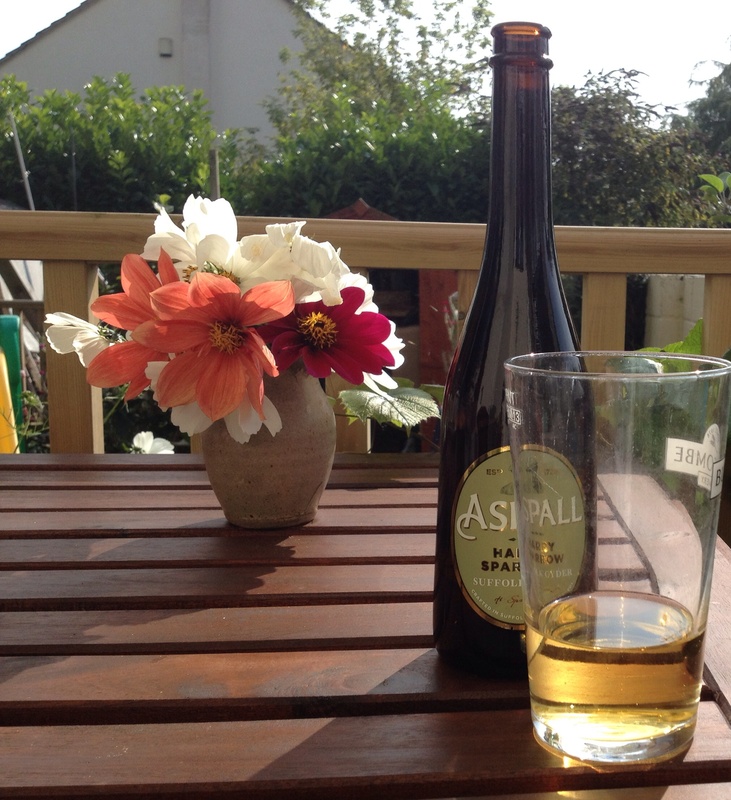 Bishop’s Children blooms alongside Cosmos Purity, making my summer cider all the better. 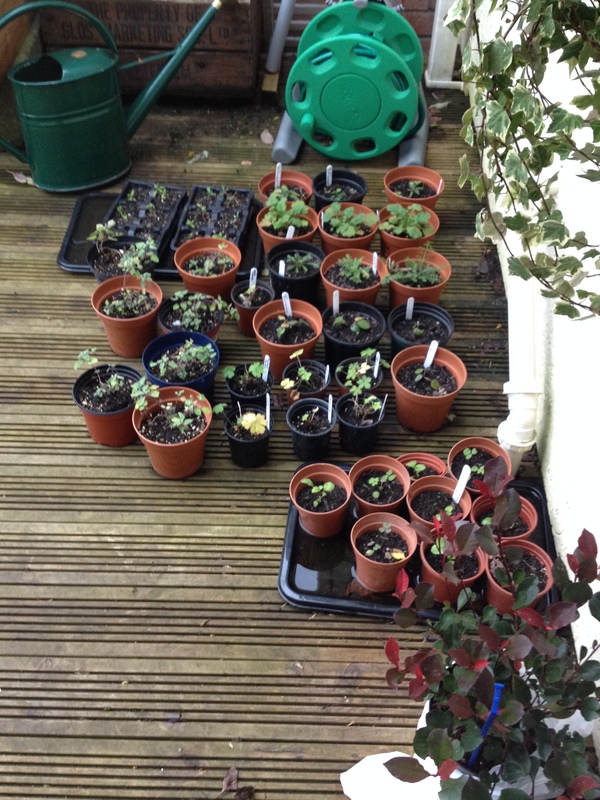 Finally, I’ve accumulated various young plants grown from collected seeds (Sweet Williams from my Mum, Aquilegia from seedheads in a hedgerow) or purchased from Hayloft Plants and I’m sure these will need protection. The Fella knocked up a coldframe in the summer, so I’ll cosy them up in there for winter. First post, first confession. My little back-garden borders have had two growing seasons, but already at least three planting schemes. My inexperience, indecisiveness, over-excitement, whims, fads and impulse-buying at the garden centre have not been the best recipe for a gorgeous garden so far. So I’m going to bite the bullet and commit to screen my ambitions for my soil-filled spaces in 2015. I’m hoping this will strengthen my resolve to stick to my guns, let the poor plants have time to do their thing, and maybe even save me some money. I want the back garden to be a flower-filled oasis of soul-restoring loveliness. Full stop. …errrm by which I mean, a long flowering season with blocks of colour from spring to late summer. I’ll post more about the planting scheme in the months to come, but briefly I’ve tried to move from lots of different plants packed in, to fewer types given more space and light to thrive. The key planting groups are primrose, daffs, lychnis, hardy geraniums and penstamons. In the allotment, I’m really hoping the back-breaking hours I put in clearing couch grass this summer will pay off with a wonderful softfruit harvest. Raspberries, strawberries and blackberries will be great fun to pick with my daughter, and enjoyed by us all. And they cost a bomb in the shops. Just one of the couch grass mountains produced from my weeding efforts this summer! Inspired by Rachel de Thame I’m going to donate some veg-growing space to cut flowers. It’s such a treat having flowers in the house, and giving them to loved ones, but I just don’t have the space to grow for cutting at home. I think it’s the maincrop spuds that’ll get the boot. Finally, I’m going to have one last attempt at growing sweetcorn. Year 1: barely any germination. Year 2: poor germination, a second sowing, and only two cobs worth picking! This year I’ll do a bit of reading and start early. That’s it. Those are my main objectives, let’s see how we get on.